See more Kate Spade Scarves. We check over 450 stores daily and we last saw this product for $155 at Bloomingdale's. 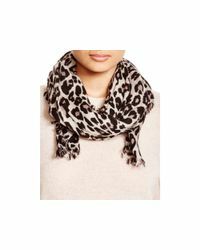 Keep warm and forever fierce in kate spade new york's wool scarf, flaunting a meow-worthy leopard print. 28" x 77". Frayed edges. Fabric Content: Wool. Country Of Origin: Imported. Product Care: Dry clean.